The Stormy Monday workshop aims to provide the player with an understanding of a range of scales / lines and phrasing techniques suitable for this type of blues improvisation. 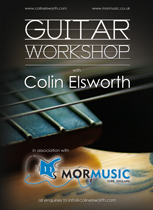 Knowledge of a standard 12 bar progression and of major and minor pentatonic scales is desirable, as the workshop will move beyond the scope of these basic ideas into more advanced areas such as the inclusion of chromatic chords, the I VI II V turnaround, the mixolydian mode, the minor6 pentatonic, the altered scale and tritone substitutions - all delivered in such a way that enables you to use your existing knowledge of basic ideas to create complex and sophisticated lines via subtle manipulations. This workshop is aimed at the intermediate/advanced player that feels their soloing vocabulary needs spicing up a little. They are run in such a way that no-one has to perform on the spot if they don't want to, but each player will have the chance to if they do. The most important thing to try to take away from the 2 hour session is an understanding of the principles involved, so you can then apply them to your own playing at your own pace.